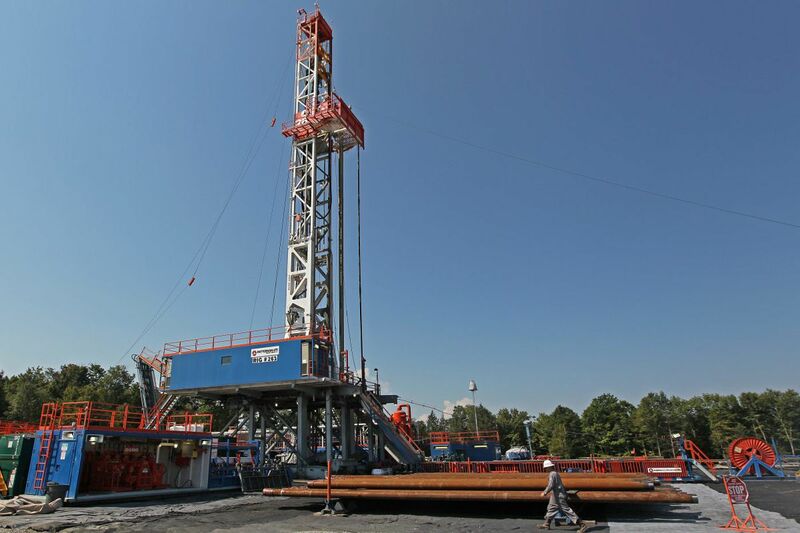 A shale-gas drilling rig in Susquehanna County. Janney analyst Michael Gaugler likes the stocks of three companies backing projected pipelines to bring upstate gas to Philly. When utilities stock analyst Michael Gaugler returned to the Philadelphia brokerage Janney Montgomery Scott two years ago after a decade of picking stocks for rivals, he told his bosses he wouldn't need a lot of airline tickets: There are many potentially lucrative stories among smaller U.S. energy- and water-related companies with operations right in Pennsylvania and neighboring Mid-Atlantic states, he said. Even with today's low natural gas prices, the Marcellus Shale gas boom and neighboring fuel and liquid resources would keep brokers and bankers busy with pipeline, utility, and industrial projects for years, Gaugler predicted. And gas utility prices rose, before plateauing recently. Companies whose price-to-earnings ratio averaged 17 in 2015 — not much more than old-line electric utilities with fat debt loads and static customer bases — "are now in the 20s," at premium-price levels. The stocks rose on hopes that gas will keep displacing other energy sources, fueling more residential, commercial, and export demand and higher profits, he told me recently. He's gotten clients' attention. Gaugler's Utilities & Infrastructure Weekly, which covers 25 mostly small water, gas, and electric utilities and firms that supply them, has become one of Janney's most-read investment publications. He's betting premium prices for gas-related companies, at least, will continue: "There's so much going on." But he's not wholly bullish: Of 25 water, electric, and gas utilities, industrial firms that supply utilities, and gas partnerships on Gaugler's stock watch list, he rates 14 as neutral, the 11 others as buy. Most of the Philadelphia-area companies that form part of Gaugler's coverage list are among those rated buy. The water and sewer system owners American Water Works, which is based in Voorhees, and Aqua America, of Bryn Mawr, suffered lower-than-expected demand during the first half of the year due to wet weather in the Northeast. Yet the group of water distribution stocks in which they are lead players were up a collective 10 percent in the first half of the year. And Gaugler predicts that Aqua, his group's "top pick" among water utilities, will profit especially from Pennsylvania Utility Commission approval of pending rate hikes over the next year. He's also bullish on Ametek, the Berwyn-based electronic-instruments and electromechanical equipment maker, and is looking at other area manufacturers that count utilities among their customers. Gaugler finds it ironic that industries and gas consumers in Philadelphia, Pennsylvania's largest market, don't much benefit from cheap Marcellus Shale gas because it's not yet coming into the area on the existing pipeline network. WGL Holdings Inc., the Washington, D.C., utility with an interest in the Central Penn pipeline project approaching Philadelphia's western suburbs. Gaugler rates UGI and Chesapeake "buy." He's "neutral" on WGL and South Jersey Industries at recent prices. He also has a buy rating on AmeriGas Partners, the King of Prussia propane supplier whose largest owner is UGI.